Jamie Ward has credited manager Michael O’Neill with taking Northern Ireland to the brink of a first European Championship. The Green and White Army last experienced a major tournament in the 1986 World Cup, but go into their final double header top of Group F.
That already guarantees them a play-off, with victory over Greece at Windsor Park on Thursday enough to seal an automatic spot. And Nottingham Forest forward Ward believes the reasons for that shift in fortune lie largely with the boss. 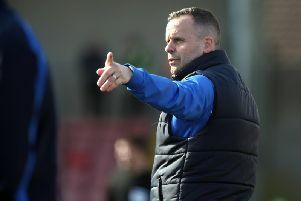 Ward came into the fold under Nigel Worthington, but only became a first-team player when the former Shamrock Rovers boss began freshening up a side that had lost its way and tumbled down the rankings. A fifth-placed finish in O’Neill’s first campaign was an inauspicious start, but the building blocks were in place for what has been a remarkable run of results this time around. “When I first came in results never really went for us, and I was lucky to get a game under Nigel,” he said. “A lot of things have changed since then, we seem to have got some shape about us, we’ve been structured in the way Michael wants us be when we’ve not got the ball. “Younger, fresher legs help too, new blood always does. The place has been freshened up with new players. “Maybe the players who’ve come in have wanted to prove a point that they can play at this level and do a job. “Michael wasn’t afraid to change the squad and bring in new faces, which the previous regime was. “I think he’s proved how good he is. Taking this job he had nothing to lose because did anyone really expect us to do anything? Not really. Goalkeeper Michael McGovern had an evening to forget against Hungary last month. The Hamilton stopper made an atrocious handling error to gift the opposition the opening goal, and cut a relieved figure when Kyle Lafferty levelled at the death. He is now going head to head with previous number one Roy Carroll, but insists the rivalry is beneficial all round. “The competition is great for all of us, it’s tough but that is what we want,” he said. “To get the nod last time was a big achievement for me. Roy has been excellent since he came back into the squad under Michael and big Alan (Mannus) has been one of the best goalkeepers in Scotland for the past four years. “I have waited a long time to get a chance and all I can do is try to take the opportunity. “Michael watches all of us. It was good to know he was keeping an eye on me, coming to a couple of my games after the last double header, so he was there to see how I reacted after the Hungary game and thankfully my form has been good.